Rotherham United target Tom Bradshaw has handed in a transfer request at Walsall. The striker’s decision will open the door for him to move to a Championship club. 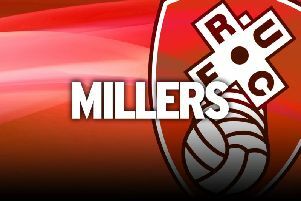 The Millers are ready to break their transfer record to land the Welsh international and have already submitted a club-record bid. Walsall issued a statement this afternoon saying: “Tom Bradshaw has today submitted a written transfer request outlining his desire to leave Walsall Football Club. “The 23-year-old signed an improved two-year contract last summer and the club have attempted to renegotiate a further enhanced contract in order to keep Tom at the Banks’s Stadium beyond next season. “However, Tom has made his desire to leave abundantly clear, rejecting any offer of a new contract, which expires in June 2017, stating that he seeks Championship football in order to enhance his international career. “While the club are disappointed with Tom’s stance, given that they have played an instrumental part in his development, which has culminated in him achieving full Welsh honours during his time here, the club have reluctantly accepted his request but have reiterated to Tom and his representatives that no player will leave Walsall FC unless the club’s valuation is met. Rotherham’s current highest fee is the estimated £400,000 the club paid for Jonson Clarke-Harris two seasons ago and it is thought they have offered more than £500,000 for Bradshaw who has scored 40 goals in 87 appearances for the Saddlers. He has been on the Millers’ radar, along with Millwall hitman Lee Gregory, 27. He was named in Wales’ provisional squad for Euro 2016 but had to pull out through injury. He is fit again now and has been in pre-season training with Walsall.